This is a guest post written by John Rama. Please see the end of the article for bio. In today’s day and age, there is nothing wrong with being a savvy consumer. 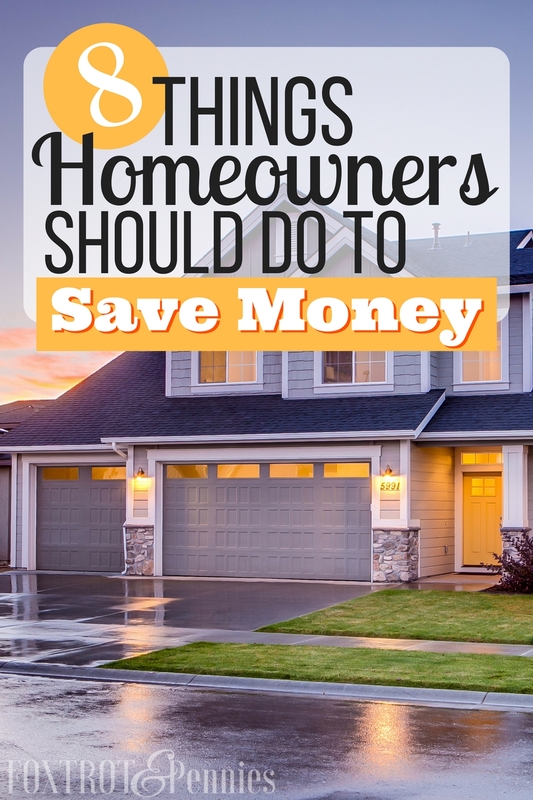 After all, as it’s always said, “A penny saved is a penny earned.” If you’re a homeowner looking for ways to save money, here are eight recommendations to reduce expenses so you can tuck extra funds away for a rainy day. Much like insurance companies, many cable and wireless providers offer discounted bundle packages to their customers. In the case of cable providers, homeowners who have multiple services, including telephone services, high-speed internet, and cable television, can save by purchasing these services as part of a bundle package. Wireless providers also have made strategic marketing moves by offering family or multi-line calling plans to make managing your wireless bill and more affordable. Bundle packages are helpful in budgeting and forecasting your expenses so that you can plan more efficiently. There is no doubt that credit cards can help make life easier. In some cases, modern credit cards offer perks such as cash back or point awards that can get applied to other purchases, such as travel. When responsibly used, credit cards are a great tool for managing expenses or getting rewards for using them for regular purchases. By paying off your balance in full every month, consumers can avoid paying costly interest charges that nullify any real or perceived benefits that their credit cards offer. Depending on the terms of your credit card agreement, interest charges can range anywhere from 0% to as much as 30%. By paying off your balance in full every month, you can avoid paying up to .30 cents in interest on each and every dollar you borrowed. If you’re unable to pay your balance in full, the very least you’ll want to do is make the minimum payment on or before the due date in order to avoid paying late fees, which can cost as much as $39 extra. People who are savvy about their finances know that getting a better deal is a method to save more money. Over the last few years, prime interest rates have remained low, giving well-qualified borrowers a chance to refinance debts at the more competitive rate. Regardless of whether you want to streamline multiple credit cards into one payment or you’re looking for a better rate on a home or auto refinancing, reducing the overall amount of money you spend on APR is an intelligent decision. Most insurance companies offer their customers multi-policy discounts when they have various assets insured through them. Instead of paying multiple insurance companies for life and health insurance, as well as insurance for your home, cars, boats, or other recreational vehicles, working with one company makes it easier and more affordable to assure that all of your assets have the insurance coverage they need. Additionally, insurance companies often offer a discount if you’re willing to pay your premiums on a semi-annual or annual billing plan, because it reduces their paperwork and processing fees. Also, be sure to inquire about incentives and cheaper insurance rates if you have home security systems and anti-theft protection on your vehicles and home since they reduce the risk of loss and damage. individual or company-sponsored 401(k) retirement plans help you take the necessary steps to provide a more stable financial future for yourself. In some cases, an employer-sponsored 401(k) may “match” a certain percentage of your savings, so you’re able to amass savings faster. For federal employees and members of the uniformed services including the Ready Reserve, the Thrift Savings Plan (TSP) is a retirement saving and investment plan for long-term saving. Established by Congress in 1986 as part of the Federal Employees Retirement System Act, the TSP offers the same types of savings and tax benefits that many companies extend to their employees in a 401(k) plan. Similar to a 401(k), the TSP is a defined contribution plan, and your retirement income will be determined by how much you (and your agency, if allowable) put into your account during your working years. Participating in a savings plan like the TSP will significantly increase your retirement income, and you should start participating as soon as possible. Contributing early will increase the value of your investment through the compounding of earnings. While buying in bulk may require you to pay more money for goods up front, the savings you realize are often worth it. Typically, items sold in bulk have a much lower “per unit” cost than paying retail for non-bulk goods. Further, by buying essential products in bulk, you save time and money by not having to buy these products each and every time you shop. As a homeowner, you can qualify for a broad range of tax deductions that reduce your overall tax liability at the end of the year. For instance, if you use part of your home for business purposes, you qualify for deductions. If you use your vehicle as part of your company activity, you can write off a portion of your expenses, including fuel, maintenance, and depreciation. Also, be sure to have your accountant check for tax credits that help reduce your year-end tax bill. If you invested in new energy-efficient windows, a new HVAC system, or you’ve installed solar panels to help defray energy costs, these home improvements could help you qualify for additional tax credits. Advancements in technology have made it so homeowners can stay in control of their home even when they’re away. Smart thermostats allow you to adjust the temperature of your home from your smartphone or tablet. After all, if no one is home to enjoy the comfort of the heat or air conditioning, there is little reason to let it run all day so that it’s at your preferred temperature once you get home. Instead, you can regulate the temperature using an app so you’re able to turn up the heat or cool down the house just before you’re scheduled to arrive. As you can imagine, this helps put you in almost complete control of your monthly energy bill. If you’re looking for ways to save more money, we hope that you’ll find these eight suggestions helpful in reducing your bills and saving more cash! Author Bio: John Rama has been the President of Sonitrol Security Systems of Charleston since 1978. Not only is he is a very active businessman and community leader, he is a coach, outdoorsman, hunter, and saltwater fisherman.